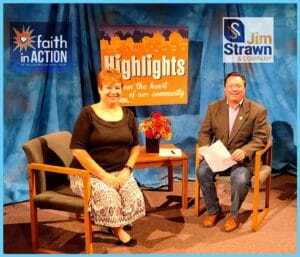 The show airing Septeber 18, 2018 – September 24, 2018 ‘highlights’ Faith in Action of the Greater Kanawha Valley & Contempory Youth Arts Company and their upcoming, Sad Mad Glad: The Musical. We interviewed Jennifer Waggener, Executive Director, Faith in Action. She discussed their purpose and mission. They value the dignity and worth of every person. They are committed to inclusive care and service. They respect the diversity of gifts that each person brings to our shared ministry and recognize the unique worth of all volunteers. They understand that there is an interdependence and reciprocity in caregiving. They believe that spirituality is a resource for health. 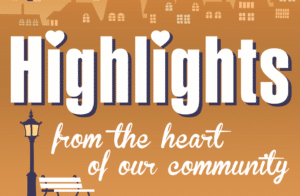 Their mission is to support the independent living of older adults in the communities we serve by lending a helping hand, neighbor to neighbor. Jennifer explains that they are an volunteer-based organization of over 200 serving over 500 seniors throughout Kanawha & Putnam counties, WV. They are funded through a few grants, donations and fund-raising events. The 3rd Annual Pedal with Purpose is set for October 7, 2018 at 1:30 p.m. at Oakes Field in South Charleston, WV. This is a family-friendly 3K run, walk, or ride. With lots of other fun things going on. Only $15 to register. If you would like to VOLUNTEER for Faith in Action, their next Volunteer Training is scheduled for October 1st. Call Jennifer to learn more. We also interviewed Dan Kehde, Director of Contempory Youth Arts Company and Chuck Stump, Co-Author of the Sad Mad Glad Book series. This guys have team up to bring us Sad Mad Glad: The Musical. The musical play is adapted from Stump & Strawn books and produced/directed by Dan Kehde and musical composer, Mark Scarpelli. Mark Scarpelli and Dan Kehde’s musical adaptation of Chuck Stump and Jim Strawn’s children’s books of the same name will debut on September 27, 2018. A dozen new songs with titles such as “Your Eyes, Your Nose, Your Skin, Your Toes,” “Why, Why, Why” and “Pozz-itivity” pack this hour-long jaunt written for the 7 and under crowd. 7:00 p.m. September 27, 28, 29, October 4, 5, 6. 2:00 p.m. September 29, 30 & October 6, 7. Tickets are $15.00 per adult and $8 for student. $5 for 6 and under. Call 304-541-4756 for more information. CYAC is scheduling performances for schools and other theaters throughout the region. Attitude is everything! And, just like academics, attitude and character are learned. The Sad Mad Glad Book – The Anatomy of Your Attitude won the 2008 Moonbeam Children’s Book Awards Gold Medal. Using vivid photos and a fun, rhyming text that incorporates American folk wisdom and popular body idioms, The Sad Mad Glad Book helps teach children life lessons by taking something they already know – their body parts, and linking them to positive thoughts and behaviors. Anyone that enjoys molding young minds will find the unique format of this book helps children share feelings and build self-esteem while they’re having fun! Another Sad Mad Glad Book-The Anatomy of Your Attitude picks up where The Sad Mad Glad Book left off. Recognized as 2009 Outstanding Book of the Year – Most Inspirational to Youth, by Independent Publisher, it uses even more body idioms and American folk wisdom to help children of all ages learn and reinforce the benefits of possessing a positive attitude and making smart choices in life. The Contemporary Youth Arts Company was originally founded in 1995 by Dan & Penny Kehde and a group of artistic young people to provide teenagers in the greater Charleston area hands-on access to the performing arts in a drug free environment. Composer Mark Scarpelli joined the organization soon, thereafter, composing original scores and becoming acting music director for the nearly 200 musical performances. Since its inception, CYAC has produced over 500 main stage performances. We also interviewed Bailey Pittman, an actress in the musical. A freshman at Capital High School, she is so excited to be in this play. She invites ALL her friends and family out to the performances.